Mackinaw City's location at the most Northern tip in the lower peninsula is the perfect destination for visitors. With Lake Michigan on one side and Lake Huron on the other side, this is a true Great Lake's spot. And the Mackinac Bridge! This spectacular bridge spans the Straits of Mackinac and connects the Lower Peninsula's Mackinaw City with the Upper Peninsula's St. Ignace. Mackinac Island visitors can reach the island by one of three Mackinaw City ferry lines. There is so much to see and do in Mackinaw City. This is a region that is rich in history. Colonial Michilimackinac, a 1770's era fort and fur trading center, has been restored and reconstructed to offer a glimpse of life 240 years ago. 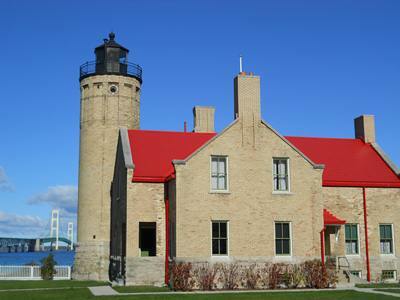 Historic Mill Creek Discovery Park and the Old Mackinac Point Lighthouse complete the historic offerings in Mackinaw City. Mackinaw City is not just about summer! Visit in the winter and enjoy some of our special events such as Winterfest each January. 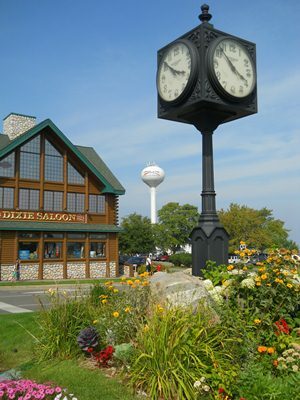 Mackinaw City has great shopping, lodging, dining, and things to do. If you're looking for more information on area restaurants, our Straits Area Menu Guide has menus galore! Come for a weekend or bring the family for a longer stay. Four seasons of fun is waiting for you!